The Little River flows north through the Twin Oaks Business Park, in East Windsor. This location is immediately south of E. C. Row Expressway, east of Lauzon Parkway and north of the Canadian Pacific Railroad tracks. On 16 November 2015, the City of Windsor officially designated the city owned property within the Little River corridor a municipal park. Consequently, our partnership decided to clean up the area around the cul-de-sac of Munich Court. In the early 1980’s, the former golf course owner drastically altered the river course from its original natural state. A dam was constructed to restrict the flow of water, the river was dredged and the natural slope of the valley was filled with earth, until it was nothing more than a U-shaped drainage ditch. Due to the severe slope of the riverbank, plants were unable to take hold and that made the banks erosion prone. Sections of the streambank “slumped” after the Spring thaw sending soil to the river bottom. Consequently, a “muddy river” would flow during high water levels. Flora and fauna observations by the Little River Stewardship Study/ Biological Inventory in the Twin Oaks Corridor (1994) included: American Toad, Black Oak, Muskrat, Red Fox, Slippery Elm, Great-Horned Owl, Leopard Frog, American Basswood, Fox Snake (species at risk), Staghorn Sumac, Red – tailed Hawk, Shagbark Hickory and Snapping Turtle. The Twin Oaks Golf Course was sold to the City of Windsor to be developed as a Business Park. This section of Little River was isolated and, unfortunately, many people used the area as a convenient dumpsite. Therefore, the Little River Enhancement Group (Lil’ Reg) targeted this area and mobilized our volunteers for 4 cleanup events: Saturday, 23 April and Saturday, 22 October 1994; Saturday, 20 April and Saturday, 19 October 1996. Develop a trail for public access. The concrete dam was demolished and the debris removed from the valley. The entire amount of fill that had been dumped into the river valley was extracted and placed along the top of the restored valley slopes. It formed the base of the 1.2 kilometre recreational trail that the City constructed along the east side of the river. Bulldozers carved the slopes back into a functioning river valley and a meander was created in the riverbed. Stormwater retention ponds have been designed to receive roof and parking lot runoff. The tiny particles suspended in the runoff settle to the bottom of the ponds and do not flow into the river. Tributaries with rock chutes have been added throughout the Business Park to help prevent erosion from the surface runoff. The entire area was then seeded. The asphalt pathway provides a unique recreational, “connecting with nature” experience. Trail users will see excellent views of the naturalized corridor with the Little River and hopefully enjoy some local wildlife as well. This project was funded and/ or supported by the City of Windsor in partnership with, Environment Canada/ Great Lakes 2000 Cleanup Fund, Essex Region Conservation Authority (ERCA), Detroit River Canadian Cleanup (DRCC), Great Lakes institute of Environmental Research/ University of Windsor, Essex County Nature (ECN), EcoAction 2000 and Lil’ Reg. This Stream Restoration Project was a tremendous achievement. It was, and is, an excellent example of a ‘multi-purpose’ project, which provided trails for passive recreation, while greatly enhancing flood control, water quality and wildlife habitat. In essence, a “natural gem” has been created by the project partners. As well, students from the former Concord Public Elementary School and Riverside Secondary School were invited by the City and ERCA to plant trees and shrubs in the restored river valley. Students and adult volunteers participated in 5 planting events: 24 April, 6 May and 12 November 1998; 29 October 2005 and 4 May 2006. Community volunteers planted over 1 800 trees and shrubs in the Little River valley at Twin Oaks. Some of the species of trees and shrubs that were planted include: Burr Oak, Buttonbush, Sycamore, Red-osier Dogwood, Basswood, Elderberry, Swamp White Oak, Red Cedar, Black Willow and Kentucky Coffee tree. Development of the area brings to mind the phrase, “Build it and they will come,” the road was built; they did come and illegally dumped their garbage and tore up the parkland with their off-road vehicles! 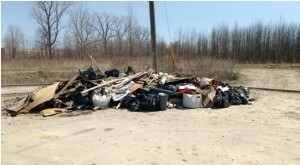 At the request of the Little River Enhancement Group, the City of Windsor cleaned up the extensive amount of garbage that was illegally dumped at the Munich Court cul-de-sac. Using a front end loader and truck, the company hired to do the job hauled all the garbage away that was at the end of the cul-de-sac. Concrete barriers were placed across the road to prevent more dumping and access to off-road vehicle. A “Tip of the Hat” to Councillor Hilary Payne (Ward 9) for being instrumental in getting the garbage cleaned up and the barriers installed. Unsurprisingly, people came and dumped their garbage in front of the barriers and the off-road vehicles drove around them. This illegal activity has caused a tremendous amount of surface damage to the new park. For the past few years, Kelly Laforest (Caesars Windsor CodeGreen group) has contacted Caroline Biribauer (ERCA) and requested a site for them to clean up. Caroline coordinates and organizes the event to help them celebrate Earth Day. The CodeGreen group chose to clean up the Twin Oaks Business Park site for their first time. On Wednesday, 13 April, over 60 volunteers participated in Little River Cleanup Event # 38. Mother Nature presented us with a good day: 8 C temps, some clouds, but mostly sunny; a light wind and thankfully zero precipitation! Eager volunteers cleaned up from 5 to 7:00 p.m. This was the 5th time the community has cleaned up the debris from Twin Oaks. Along with the CodeGreen group, there were volunteers from the City of Windsor, the DRCC, Essex County Nature, and Lil’ Reg. This robust working group collected an impressive pile of garbage. The riparian zone of Little River looks a lot better from the volunteers’ efforts. Lil’ Reg and ERCA appreciate CodeGreen for mobilizing their volunteers and helping to coordinating this cleanup event and look forward to working with them in the future. Also, we would like to express a big thank you to the City of Windsor/ Environmental Division for hauling the garbage away; placing the cement barriers and assisting our group with the cleanup. Together, our partnership will endeavour to create a natural area that will improve the ecosystem health of the Little River and be enjoyed by people making the much needed connection with nature. Join ERCA, DRCC, and hundreds of individuals from across the region for the annual Earth Day Tree Planting Celebration, happening from 10am to Noon on April 24 at Florence & McHugh, just east of the WFCU Centre in Windsor. More than 2,000 trees will be planted at this event, with the help of people from over 40 local businesses and community organizations and the support of the Detroit River Canadian Cleanup. Businesses and community organizations invited to register a Green Team, and can receive a special plaque by registering at www.erca.org/EarthDay. Individuals and families are also welcome to attend – even if they are not part of a Green Team. These organizations, as well as the winners of this year’s Earth Day Student Contest will be honoured at the event. Guests are encouraged to bring their own shovel if possible. There will be a limited supply of tree planting tools available. Attendees can also enjoy a seed bomb craft, an invasive species paper-making demonstration, and coffee courtesy of Starbucks. City of Windsor Earth Day celebrations will be held on Sunday, April 24, 2016 from 10am until 3pm at Malden Park (4200 Malden road). This event is free for the public. There will be over 40 environmental exhibits, wildflower planting, a vegetable seed exchange, nature scavenger hunt and many more environmental activities. Visit the DRCC exhibit and receive a re-usable water bottle! Earth Day is a day on which events are held worldwide to increase awareness and appreciation of the Earth’s natural environment. Earth Day Windsor Essex has been celebrated since 1989.